Western blot analysis of extracts from LNCaP (AR+), MCF7 (AR+), PC-3 (AR-), and DU 145 (AR-) cells using Androgen Receptor (D6F11) XP® Rabbit mAb (upper) and β-Actin Antibody #4967 (lower). 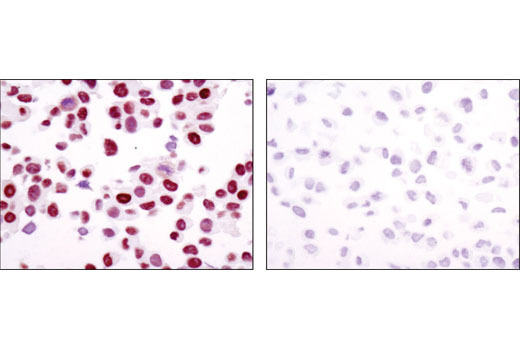 Immunohistochemical analysis of paraffin-embedded LNCaP (AR+, left) and DU145 (AR-, right) using Androgen Receptor (D6F11) XP® Rabbit mAb. 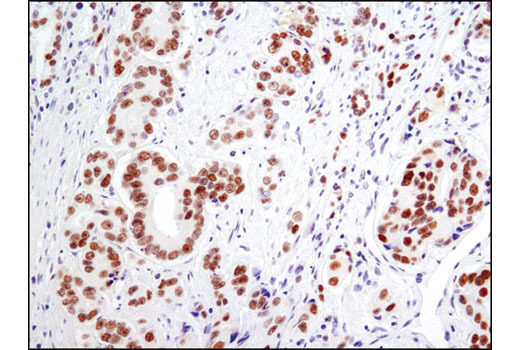 Immunohistochemical analysis of paraffin-embedded human prostate carcinoma using Androgen Receptor (D6F11) XP® Rabbit mAb. 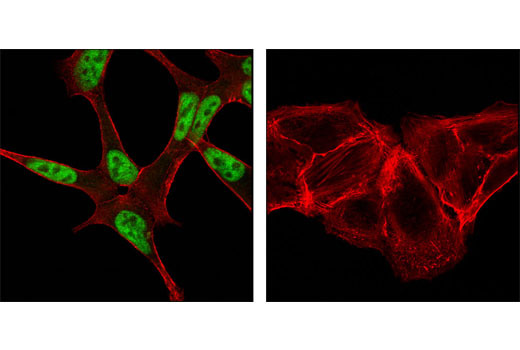 Confocal immunofluorescent analysis of LNCaP (positive, left) and DU145 (negative, right) cells using Androgen Receptor (D6F11) XP® Rabbit mAb (green). Actin filaments have been labeled with DY-554 phalloidin (red). 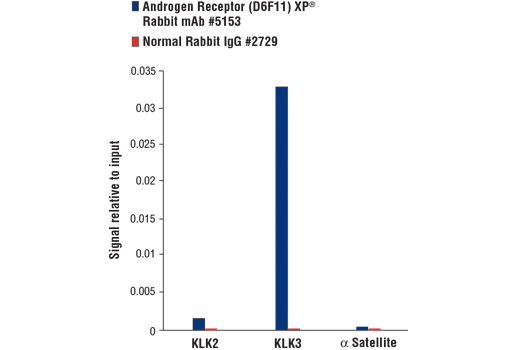 Flow cytometric analysis of DU-145 cells (red) and LNCaP cells (blue) using Androgen Receptor (D6F11) XP® Rabbit mAb. Chromatin immunoprecipitations were performed with cross-linked chromatin from LNCaP cells grown in phenol red free medium and 5% charcoal stripped FBS for 3 d then treated with dihydrotestosterone (DHT, 10 nM) for 4 hours and either Androgen Receptor (D6F11) XP® Rabbit mAb or Normal Rabbit IgG #2729 using SimpleChIP® Plus Enzymatic Chromatin IP Kit (Magnetic Beads) #9005. The enriched DNA was quantified by real-time PCR using SimpleChIP® Human KLK2 Intron 1 Primers #62086, SimpleChIP® Human KLK3 Promoter Primers #32784, and SimpleChIP® Human α Satellite Repeat Primers #4486. The amount of immunoprecipitated DNA in each sample is represented as signal relative to the total amount of input chromatin, which is equivalent to one. 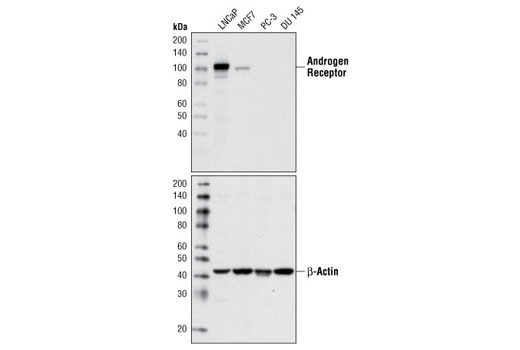 Androgen Receptor (D6F11) XP® Rabbit mAb detects endogenous levels of total androgen receptor protein. Monoclonal antibody is produced by immunizing animals with recombinant protein corresponding to residues near the amino terminal region of human androgen receptor protein. Avila, D.M. et al. (2001) J. Steroid. Biochem. Mol. Biol. 76, 135-142. Montgomery, J.S. et al. (2001) J. Pathol. 195, 138-146.